SPONSORED LINKS According to some people stroke, heart attack, and cardiac arrest are one and the same thing. These conditions differ in symptoms, background, and severity. It is important to know the differences between the conditions, know how to help a patient, and avert any of the conditions from becoming more serious. It refers to a circulation disorder and if the blood flow is blocked or deprived of oxygen, the blood will not reach the heart muscle and can kill the organ if not promptly treated. 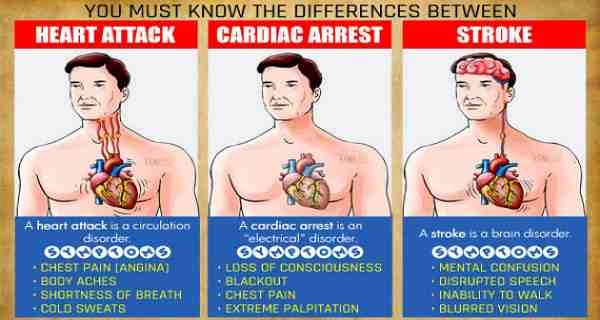 The heart still functions once a person suffers a heart attack. The symptoms are treatable with meds and a healthy diet. The symptoms occur rapidly and are mostly lethal. Ischemic stroke – it happens when the artery oxygen supply and blood to the brain are blocked.